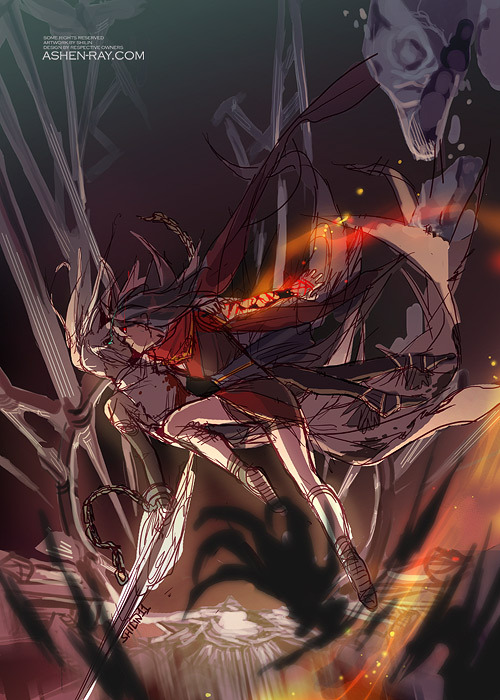 Blackbird freed Veloce from somewhere (hence the chains) and they are escaping together. Veloce is weakened but there is stuff she can do that blackbird can't, and vice versa, to fight off the things that are chasing them, so instead of just carrying her out, Blackbird is supporting her (arm around the shoulder) and they fight their way together. Here they made it to some ridiculous abysmal interior that goes down to like the center of the earth and jumped off for cinematic purposes! hurhur. VelXBB lovers hearts are beating faster now. I'm sorry, I had to get that out of my system first. I find that Vel's body doesn't connect well with the perspective of the background though… She seems to be falling at an angle (unless that was intended!) and her legs just seem out of place. hmm she isn't falling, they were running together with blackbird supporting veloce, jumped off this cliff (with column all around it i don't know why) and turned around for this shot, if that makes sense! I need to stop coming up with elaborate leading-up motions since it doesn't help the actual image any HAHAAHA. I'm sorry, I couldn't resist. it's so lovely. Never thought orange, red and purple shades could work well together but I can't stop staring at that background!